– Set your Intention at the Opening Circle on Sunday February 26th at 2pm! – YOU decide what your practice is! 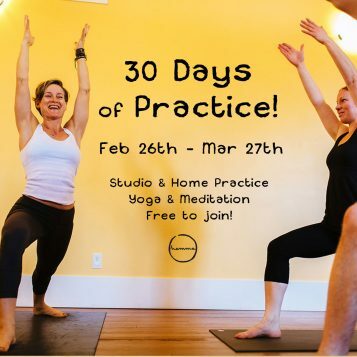 – Anywhere you practice counts: classes at Hemma, online, other studios, and home practice. -Whatever you practice counts: Yoga, meditation, pranayama, mantra, qi gong, Bhakti Yoga, Karma Yoga, and more! – Each time you practice at Hemma, enter your name for a 1 month pass! – Help yourself to the resource binder for support. – Know that you are joined by community and we are doing this together! !